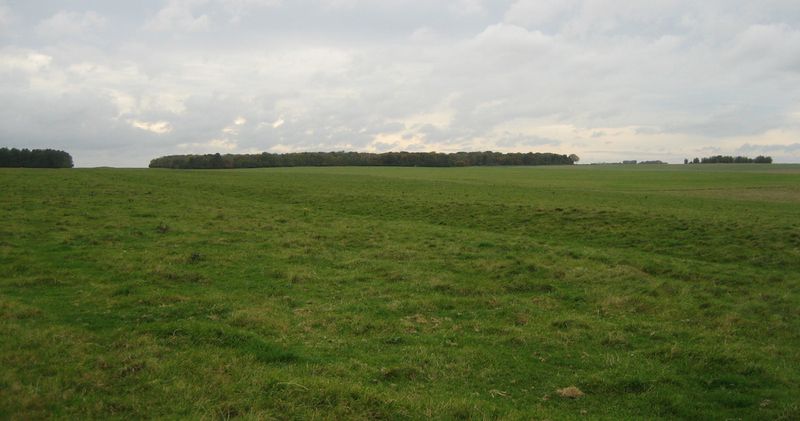 AMONGST other places that I had failed to visit until relatively recently was Stonehenge. Before I became enthralled with the massive ruins of Bronze Age Greece and Crete, large stones were …. well, just large stones. And in the UK they were large stones surrounded by bleak and inclement weather. Anyway, my son, Toby, and I went on an ‘historical’ weekend away visiting Glastonbury (previous blog in October) and Stonehenge. There is a new centre and museum there (well, sort of ‘there’ – it’s about a mile away and you are transported by bus to the site which I’m not too sure about). Anyway, Stonehenge is a fascinating place. Supposedly constructed around 2600 BC (Neolithic period) – evidenced by cremated remains – it spanned for about 1,500 years. 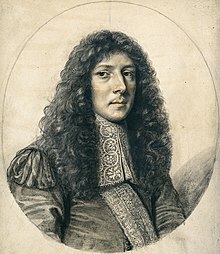 In the 17th century, John Aubrey was a pioneer of observation and imagination and in 1666 he investigated and recorded the site. His work was taken up by William Stukeley in the 18th century who made accurate plans, by way of engravings, of Stonehenge and he was the first to associate the site with the Druids. Many others have been involved in archaeological work on the area over the years (I’m not planning to go into them as Wikipedia will reveal all their names and achievements). All I will say is that the latest work has been carried out by the University of Birmingham and its task force has discovered two large pits within the Stonehenge Cursus (large parallel lengths of banks with external ditches – 2.5 km in length). The pits are aligned in celestial position towards midsummer sunrise and sunset when seen from the Heel Stone. I always find this celestial stuff fascinating – and spooky! 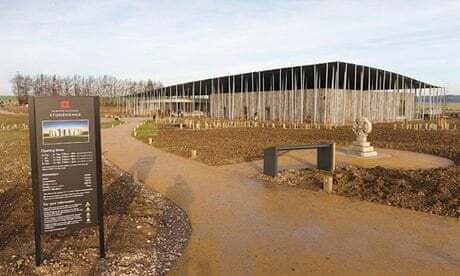 In fact, the University has also found adjacent stone and wooden structures and burial mounds around the area which could date back some 1000 years or more before the initial construction of Stonehenge (actual hunter gatherer activity goes back the Mesolithic – 10,000 BC). Many more small ceremonial shrines have been discovered in the area around Stonehenge – see Birmingham Uni’s and Austria’s Ludwig Boltzmann Institute’s Stonehenge Hidden Landscapes Project – click here. Talking of the Heel Stone – it has always intrigued me. It is situated just north of the stone circle and rises to 4.9m (16ft) and leans towards the circle. What is it doing there?? Mind you, one can say that about any of the stones. Clearly ritual (archaeologists’ classical explanation for anything they can’t explain). In this case, however, it probably really is ritual and associated with burial. The other factor that amazes me is the mortice and tenon joints on top of the circle stones. This is carpentry work as we know it today, yet ‘they’ were doing it 5000 years ago! Who were ‘they’? 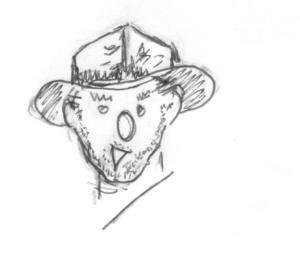 Neolithic men with technical abilities – aka Stone Age architects, surveyors and builders. Okay, ‘they’ had the construction know-how but just how was the stone circle physically built? And by whom? Giants of course. The first known depiction of the stones shows this. It is from Roman de Brut (c 1150) which was a verse literary of Britain by a poet called Wace. This, itself, was based on another 12th century work, Historia Regum Britanniae (c 1136), by Geoffrey of Monmouth. 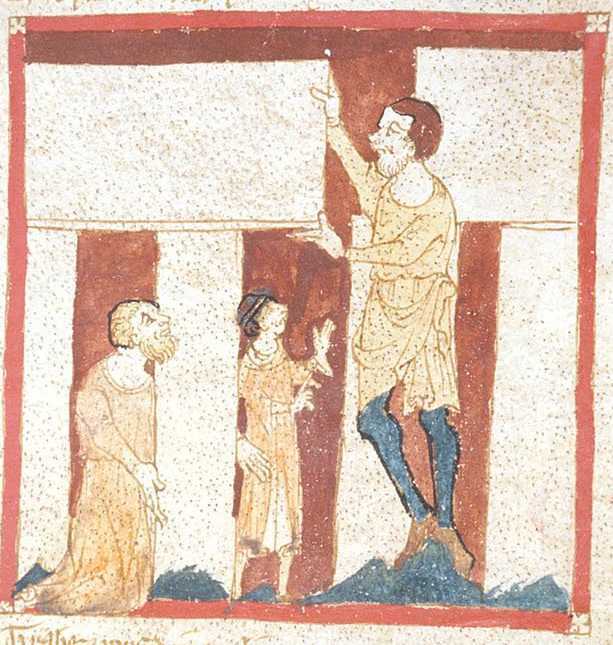 According to Monmouth’s historical tale and Wace’s depiction, King Arthur’s very own Merlin built the circle with the help of giants. Just the man, and men, for the job. But seriously, we can only assume that the builders had good knowledge of blocks and pulleys. Ownership: Henry VIII took control of it when he dissolved the monasteries between 1536 and 1540 which included Amesbury Abbey on whose land the stone circle lay. Henry gave the Abbey and its land to the Earl of Hertford in 1540. It was later owned by none other than the Marquess of Queensbury but he didn’t turn it into a boxing ring. Eventually the site was auctioned off in 1915 and purchased by one Cecil Chubb for the grand sum of £6,600. It has been suggested that he purchased the stones as a present for his wife but she was less than pleased with the gesture. He donated it to the nation in 1918. Good man. It’s now owned by English Heritage. 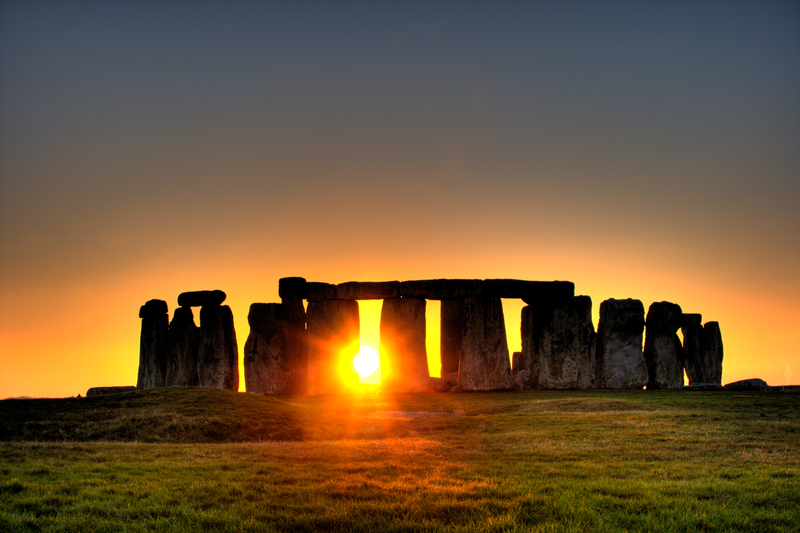 Stonehenge was revived as a religious site by the Neo-druids at the beginning of the 20th century. The Ancient Order of Druids carried out an initiation ceremony in 1905 but it was not well-received by the press. I imagine that Neo-pagansim would have been frowned upon by a Britain just emerging from the Victorian Age. But Stonehenge and Druids seem to me to go together rather like bread and butter. I mentioned the Druid, William Price (he who ‘invented’ cremation), a few blogs ago in January, and, although he lived in Wales and died in 1893, I wonder if he knew of Stonehenge? It seems he did not visit it after becoming a druid in 1840 as I have found no mention of him leaving Wales after that date, but I may be wrong. 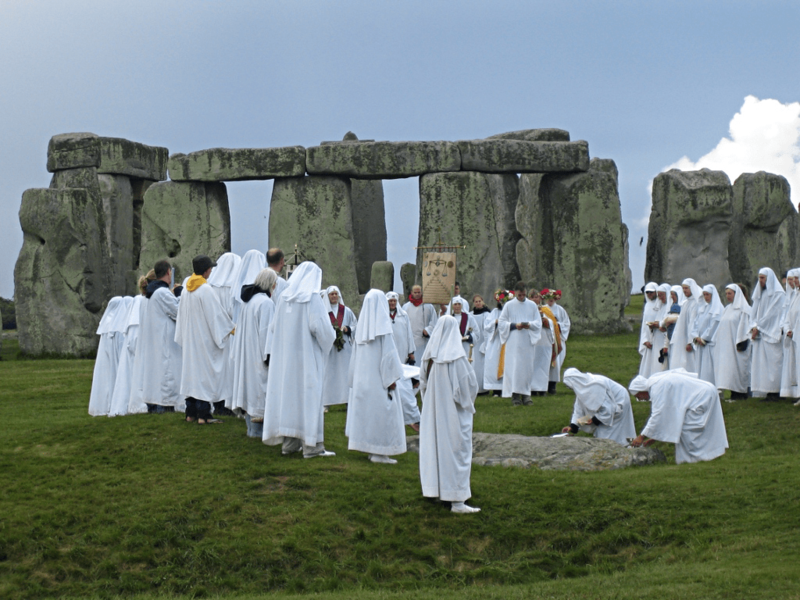 I believe ritual use of the circle by druids is now very much restricted. We know very little about the ancient druids as there are no written records of their activities or any archaeological finds relating to them. We know they existed because Julius Caesar tells us in his Commentarii de Bello Gallico around 50 BC but it was the Romans who suppressed them following the invasion of Britain in AD 43 (under Emperor Cl..Cl..Cl..Claudius). In fact it was Julius Caesar who suggested that druids went in for human sacrifice. Well, the Romans would know all about needless human ‘sacrifice’ even if not in the name of a god. Some human remains recently found indicate possible human sacrifice (violent death at least) but who were involved is not known. So there you are – just a dip into the ancient stone circles to whet your appetite should you wish to visit the place. 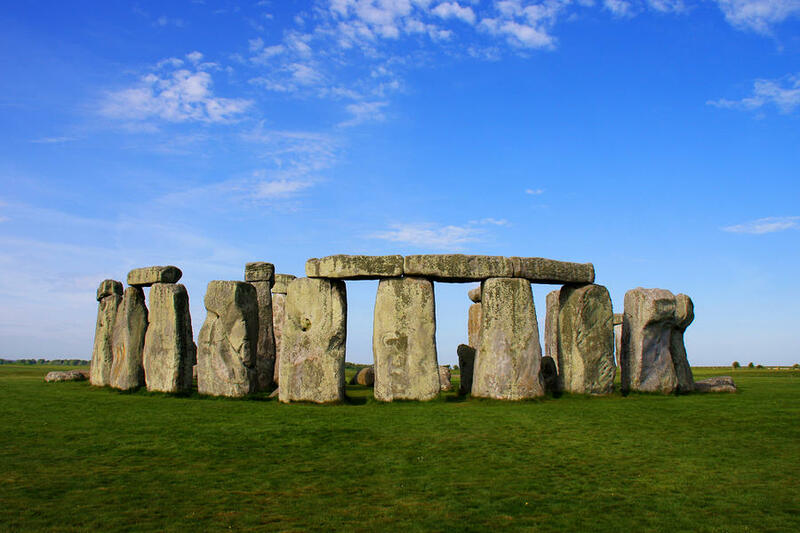 Bearing in mind the complexity of archaeological activity around the area, Stonehenge was a very important and significant site during its existence. For more info on it, click here.